When: 1st August. Where: Hatfield House. 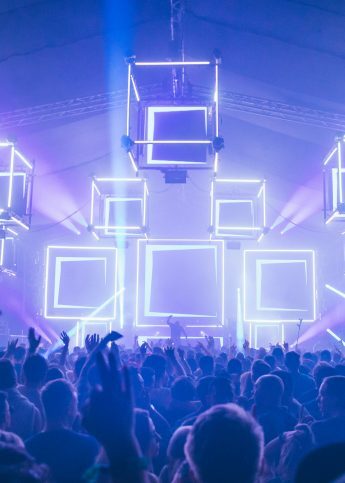 What: Taking place at Hatfield House for a second year running, the underground house and techno festival is boasting a stellar line up that includes the likes of Jamie Jones, Miguell Campbell, TEED, Richy Ahmed, Guti and a whole host of others. Only a short train ride from London, with an array of after parties on offer in the capital, Eastern Electrics is our go to for guaranteed hedonistic fun. When: 6th – 9th August. Where: Cornbury Park, Oxfordshire. What: One for the grown-ups amongst you, Wilderness places musical acts on an equal pedestal to wellbeing, theatre, food and debates. So let’s take a look at the best from each. Björk will be on the main stage, no doubt doing weird and wonderful things and you can see a full performance of Alice in Wonderland or if that’s a bit too conventional for you, there’s all manner of circus acts dangling from trees all weekend. Grab a ticket in advance for a long table banquet for five course dinner with wine with a different chef taking to the kitchen each night and try and squeeze into the tent for Sunday Papers Live, where the newspapers will be performed section by section by poets, politicians and writers. There won’t be enough hours in the day. When: 13th – 16th August. Where: Matterley Estate, Hampshire. What: For one weekend a year, this corner of the world turns into a man made town, with pop up stages, stalls and shops. Split into districts, the “city” is separated into areas each with their own line up. We like the look of Whistler’s Green for some down time and Dstrkt 5 for late night partying. There’s usually something behind every door at Boomtown, we’ve heard urban legends from friends about falling into rooms and finding one man, raving alone, behind. With a line up so long it’s intimidating, we suggest you play the game where you close your eyes, wiggle your finger and go see whatever you land on, you’ll get an eclectic mix however you approach it. When: 13th – 15th August. Where: Gothenburg, Sweden. What: Way Out West is the festival Stay Out West is the series of late night parties that follow once the gates are closed, do you see what they did there? Having only been a fully fledged fest since 2012, Way Out is a newbie in the grand scheme of things but they’ve still managed to bag Pet Shop Boys and Patti Smith as well as filling up the bill with Tyler, The Creator and Flying Lotus amongst others. When: 20th – 23rd August. Where: Brecon Beacons, Wales. What: The pioneers of shoegaze, Slowdive are our favourite pick of the headliners at Green Man. As well as our friends Sylvan Esso, we’ll be seeing countless new bands, Hookworms, Trust Fund and Corey Bowen can’t be missed and go laugh at Sara Pascoe. Fun for all the family, find streams and rivers you’re welcome to explore onsite as well as dedicated kiddies areas for the little folks with arty activities and play parks. Venture into the walled garden whenever you can to grab drinks and find an unexpected stage within. When: 22nd – 23rd August. Where: Hylands Park and Weston Park, Shifnal. What: Go get emosh at V Fest and belt out all the words to Sam Smith and Hozier’s deep ballads. When you’ve dried off your tears, listen to all the hits of the year at Annie Mac’s DJ set. Tom Jones is what we’re really looking forward too, who doesn’t know all the words to Sir Tom’s classics? Get down the front and make your Nana proud. When: 26th – 30th August. Where: Fort Punta Christo, Croatia. What: Outlook’s sister event, Dimensions, takes place a week or so prior and things travel in a clearer direction towards house, with man of the moment, Four Tet and beatmaking magician Little Dragon playing the opening concert. Offering the same format as Outlook, there will be the Amphitheatre parties as well opportunities to go island hopping (WTF!!) to the nearby Brijuni Islands. When: 28th – 30th August. Where: Richfield Avenue, Reading and Bramham Park, Leeds. What: The UK’s oldest festival, Reading and Leeds have long been the traditional place for 16 year olds to lose their minds after their first experience of adulthood responsibility – exams. If you’re no longer in your teens and considering going to one of these arenas of hormones, warm cider and mud, you’re braver than us but don’t let that put you off. Reading and Leeds are always sure to be reckless, bring out your inner teenager perhaps, go see some of the world’s biggest guitar bands, as you have always been able to at the festivals and now, moving with the times, they’re branching out into dance tents and introducing stages. We suggest you go for The Libertines, Peace and Boy Better Know. Don’t plan for any more, chances are you’ll spend the rest of the time wandering round trying to remember your own name. When: 28th – 30th August. Where: Domaine national de Saint-Cloud, France. What: On the west side of Paris, housed in the gardens designed by André Le Nôtre, Rock En Seine brings guitars to over 100,000 Parisian spectators for three days. Five minutes away from the nearest metro station, you can have a week’s getaway in sunny Paree, either beginning with the fest and winding down in the backstreets and avenues of Montmartre or vice versa. Catch classics, Interpol and intriguing (almost) newbie, Benjamin Clementine, a Londoner discovered on the metro. When: 29th – 30th August. Where: Clapham Common, London. What: Only with the best of dance and electronica on the line-up, SW4 is a two day long party in the city. Heavyweight of the genre, Fatboy Slim will no doubt be the highlight of many attendees but we’ll be up against the bars waiting for Hannah Wants, crowned as the queen of 2014 by Mixmag, we’ve seen her up and down the country, taking over the house scene and getting an appearance in for the girls. Save some energy for Sunday so you can scream along at full volume to “Where’s Your Head At” when Basement Jaxx take to the stage. When: 29th – 30th August. Where: Floriade Terrain, Haarlemmermeer. What: All about electronica, Mysteryland serves up the best from dubstep, house, techno, hip hop and disco. We’re going to be dancing down the front to Cleo’s DJ set, and pretending to be Kate Moss at Disco Smack’s appearance, who have soundtracked the supermodel’s own parties before. Jump into the party led by DJ Jazzy Jeff, just so you can say you were there and maybe he’ll drop the Fresh Prince theme tune, so you can expertly whip out your full knowledge of the lyrics. It is Mysteryland after all, be prepared for anything. When: 2nd – 6th September. Where: Stinjan, Croatia What: Coming from the creators themselves, Outlook is all about the real deal, “When we talk about bass music we don’t mean the bastardised commercial version currently being sold to children, we mean underground dancefloor music, whether it be house, techno, dubstep, reggae, dub, hiphop, garage, grime, electronica.” So head to Stinjan for sun, sea, sand and serious beats. Shy FX, Dusky and Toddla T? Yes, please. Plus boat parties, book in advance, you’ll regret it when you’re at the port, waving as all your mates disappear into the horizon. The opening night is an Amphitheatre party held in the Pula arena, one of the oldest and largest Roman amphitheatres in existence today. When: 3rd – 6th September. Where: Portmeirion, Wales. What: For one weekend a year this strange and quaint seaside town, straight out of a film set (Portmeirion was home to 60s surreal spy drama, The Prisoner), turns into a playground for a festival. Find yourself in the middle of fairytale architecture the colour of dolly mixture, housing stages for the likes of Belle & Sebastian and Grace Jones. It’s going to be as magical as it sounds. When: 4th – 6th September. Where: Stradbally Hall. What: Way back when in 2004, Electric Picnic opened as the first Boutique festival in Ireland to 10,000 customers. Fast forward to today, their audience has quadrupled and their line-up has grown and diversified even more. Psych Kings Tame Impala and Queen of the croons and catcalls, Florence and The Machine are top of our list. Also on offer are yet to be announced comedy acts and Body & Soul, an Irish sustainably conscious creative collective bringing you artists, therapists and poets, sounds niche but glorious. When: 10th – 13th September. Where: Robin Hill, Isle of Wight. What: A fancy dress extravaganza, each year Bestival has a theme and partygoers are encouraged to dress up following suit on the Sunday. This year it’s The Summer of Love! So, get your best boho gear and practice your face painting skills in preparation. We’re going to see The Jacksons and FKA Twigs and shake things up a little with Fat White Family but it’s not all about the main stages. Visit the Grand Palace of Entertainment for all sorts of strange happenings. Last year we might have been pulled on stage and maybe gotten married to a complete stranger. We can neither confirm nor deny. What happens on the Isle of Wight, stays on the Isle of Wight. When: 11th – 13th September. Where: Marrakech, Morocco. What: We’ve been hooked to Guy Gerber ever since he made us a playlist last year so of course we’d travel as far as Morocco to see the musician, producer and DJ. With a select line up, you’ve got plenty of time in between your favourite acts to take advantage of the free shuttle bus running between the festival and the towns of Hivernage and Agdal. Oasis is a little different to your typical festival, taking place in the Fellah Hotel around the expansive open rooms and pools for you to dip into between dancing. When: 12th September Where: Mote Park, Kent What: The Social claim to be, “bringing a taste of Ibiza to the south east of England.” Bless them, let’s hope that optimistic spirit rubs off on the crowd – and the weather. With a small but strong line up, our top choice is Jackmaster but with so few acts selected, each is sure to have been a stellar choice from the organisers, plus you’ll be able to cover most of them in during the day, no FOMO here.